Club Penguin Cheats by Mimo777 Club Penguin Cheats by Mimo777: New Club Penguin Parent Update! This month, Medieval Adventure Starting May 17, princesses, knights, and dragons take over the island at the Medieval Party. Members can dress up, conquer quests and defeat Scorn the Dragon King. Here’s a hint: In the Town, members who have the Skyward Staff can use it to help friends get into the magical Sky Kingdom. Puffle Trouble. Puffles+Herbert= Trouble. 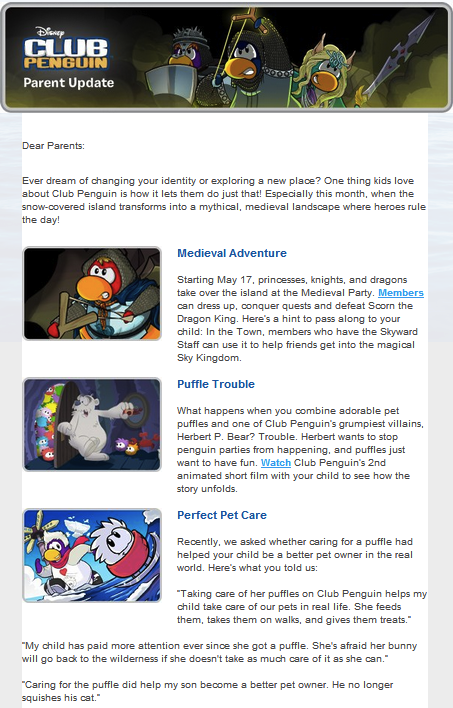 Herbert wants to stop parties on CP, and puffles just want to have fun. Watch Club Penguin’s 2nd animated short film to see how the story unfolds. Cool, huh? Did your parent get their May edition? a clue to the cat hat for puffles?